Withering heat, windy, sunny weather continue to delay sowing and planting summer crops. The 4th December was, so far, the hottest day of the year: 39C with hot, dry, westerly evening gales. Last month there were 83 taxa (different types of plant) on the menu. Thanks to the longest, driest period since moving to Brisbane in 2003, keeping diversity in production steady (at 84 taxa) is a significant achievement. Watering is time consuming. I can keep what is growing satisfied, but I can’t expand without useful rain. Fruit trees and cuttings ready for planting get priority. The chervil and flat-leaved Italian parsley have gone to seed. The turnip ‘Gold Ball’ are all finished, but proved to be the most durable turnip for keeping in the ground. While some vegetables are in very small quantities, things are quickly changing since summer annuals are sprouting as volunteers in vacant beds. One bed that had been enriched with home made compost is thick with volunteer West Indian gherkin, four kinds of Chinese spinach, love-lies-bleeding, huauzontle, red mustard, and wild purslane. The golden purslane, originally acquired as seed from Phoenix Seeds, Tasmania, have been growing fast as volunteers. Along with the Warrigal greens, also volunteers, they produced a bumper crop of juicy leaves. I put the purslane to good use before leafminer discovered them. 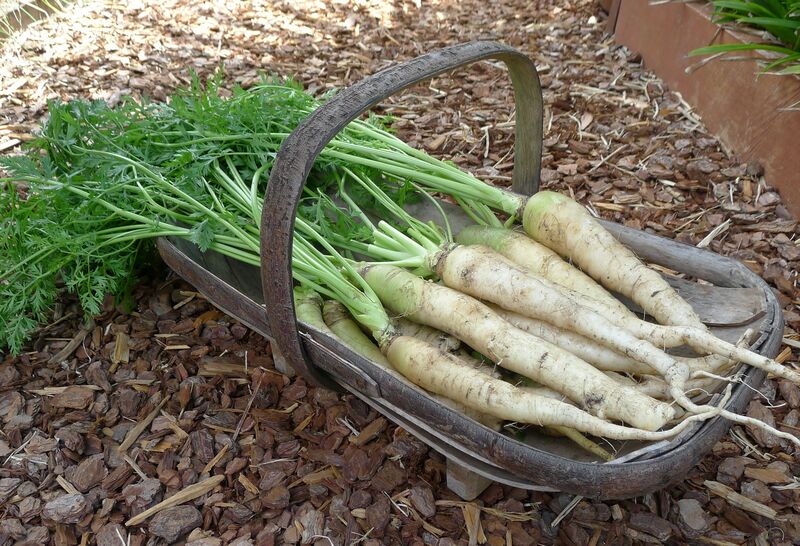 The carrots continue to crop, the ‘Lunar White’ produced the largest carrot I’ve ever grown: 503g. One single 3.5m long row was sown on 1.7.12. This cultivar started flowering immediately they reached maturity on 26.11.12. The yield is 2.33kg premium root per metre of row. ‘Lunar White’ has a strong flavour, a good size and thin skin. They’re neither sweet nor bland and the only difficulty with harvesting is that the roots are so deep the ends break off and remain in the ground. I have recently moved to Manly West and are very keen to grow herbs and vegetables. I have created 4 raised garden beds and would some some information on crop rotation and companion planting. I was wondering if you can suggest a good book that is easy to follow or would it be possible for you to provide some advice? Setting up a garden and crop rotation are covered in the Organic Gardener’s magazine-book ‘Getting Started’. Annette McFarlane wrote a good book on basic vegetable growing, also sold at ABC shops. I’m not someone who practises companion planting. It’s mostly bunkum, and all the books covering this topic merely recycle unfounded, unscientific rubbish – fairy stories.